Gunung Kei Besi is the volcano of the island of Makian, which lies in the volcanic chain off the west coast of Halmahera – Ternate, Tidore, Moti, Makian and Bacan. 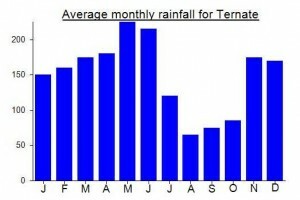 Like Gn Gamalama (Ternate) and Kei Matubu (Tidore), Kei Besi dominates the entire island leaving only a narrow coastal strip and the lower slopes for plantations. Coconut, nutmeg and cloves are the dominant tree crops with some canari and cinnamon. Wild pigs are feared for their size and ferocity, and are known to have killed people working in the plantations. 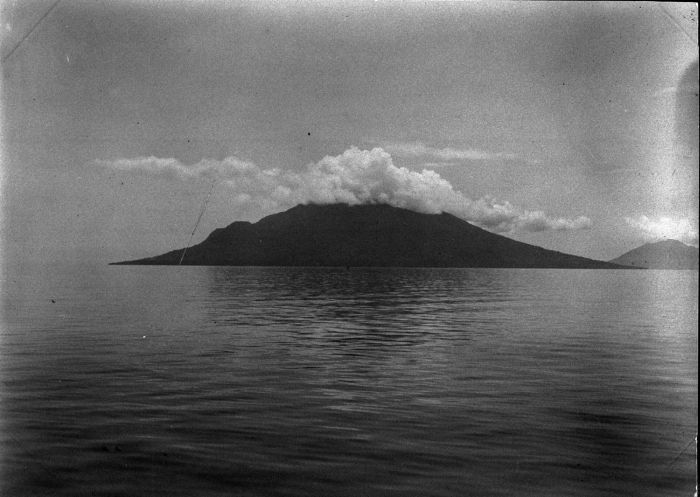 In 1975, fearing a major eruption, the government transmigrated Makianese to Kao in northern Halmahera. The resultant disputes over land between the Makianese and the local Kao people became the spark that fuelled intercommunal-religious clashes throughout Halmahera in 1999-2000. The 1988 eruption generated a 10 km high plume with pyroclastic flows. Makian is reached by speed boat from Bastiong port of Ternate. The trip by a chartered ‘speed’ takes about 1.5 hours. Otherwise, regular public ‘speeds’ take longer stopping en route in which case you may need to stay overnight in a homestay on Makian. Like Gamkonora (Halmahera) and Kei Matubu (Tidore), the active crater of Kei Besi lies at the southern end of the volcano complex. Crater walls/ridges extend towards the north forming a valley with its opening towards the coast. The Makianese know the eastern ridge as ‘Kei Besi’ and the western as ‘Solimongo’. Accordingly, if you ask for the true summit of Kei Besi they will refer you to a crag on the eastern ridge when, in fact, the highest point most likely lies on the southern end of the western Solimongo ridge. 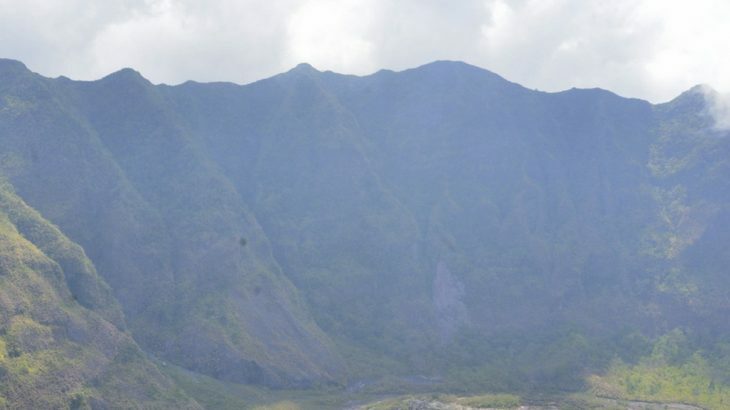 The Indonesian Volcanology agency informs that there are two routes up the mountain: one up the Solimongo ridge from the village of Sibelai to the north-west, and the other up the Kei Besi ridge from the village of Gitang to the north-east. We climbed from Gitang. Permission for the climb was sought from the Gitang Village Head but we were referred to the local Kecamatan (sub-district) office as “the Kei Besi ridge belongs to the Kecamatan, not the village”. Permissions were readily granted and the Village Head deputed guides. Some village lads joined including an enterprising chap who brought an Indonesian-English dictionary and practiced his English with us. The climb follows the usual routine for these mountains – plantations (to about 560 m) then forest to the crater rim (at about 1,030 m). Motorbikes can reach to about 300 m which would save time and effort if so inclined. The trail is fairly steep but well defined. An old cocoa plantation is reached at about 800 m. The climb from Gitang to the crater rim is, in total, about 4.8 kms and takes about 3.75 hrs. Cane grass, ubiquitous to the interface between the forest zone and the bare upper slopes of mountains in Halmahera, covers the entire rim making it difficult to see the mountain and crater except from several viewing points. Many people have climbed the mountain recently and a well cut/trodden path now exists through the dense cane grass. At about 1,150 m and 30 mins beyond reaching the rim, a large rock protrudes over the crater rim offering the first view of the mountain/crater. The mountain becomes ‘holy’ at this point although the guides did not seem to take the matter too seriously. Beyond this point, two crags provide even better views. The first crag is at about 1,300 m and takes about another hour to reach through heavy cane grass. The climb involves a very steep pitch of some 10-12 meters achieved by pulling oneself up on live cane grass stems. These aids will be depleted soon so local ingenuity with surely find an alternate route or fix a rope. The second, final crag is marginally higher than the first and another 30 minutes beyond. This crag offers the best views of the mountain/crater and of, what we believe to be, the true summit. The ‘active’ crater is currently quiet. The area surrounding the vent shows the remains of a recent volcanic mound, about 600 m across, that had apparently build up but then failed to erupt. Our guides informed that it is possible to descent into the crater area from the ‘Kei Besi’ ridge but this would require camping on the mountain. We believe that the true summit lies on the southern end of the Solimongo ridge (Google Earth) and appears quite steep to climb. An experienced local climber/guide informed that an Indonesian university group has attempted it but failed. The best approach to the true summit would appear to be from the ‘Kei Besi’ ridge, cross to the ‘Solimongo’ ridge near the ‘active’ crater and explore from there. Some technical climbing may be required. The descent from the ‘Kei Besi’ ridge to village Gitang took about 4.5 hrs. Accommodation: Homestays are available in villages on Makian. Permits: Ask the Village Head at Gitang to refer you to the Kecamatan (sub-district) office to report/register before climbing. Water sources: None; in dry season carry at least three 1.5 litre bottles. Being a group of eight, we hired a speed boat for a full day returning the same evening, at the cost of Rp 5,000,000. This amounted to about twice the regular fare on public boats but was well worth it to make the climb and return to Ternate in one day. We paid the three guides, deputed by the Gitang Village Head, Rp 100,000 each and boys who helped to carry out day packs including three large bottles of water Rp 50,000 each. Our attempt to bag Kie Besi ended in frustration, as the promised “puncak” turned out to be only a protruding crag on the northeast crater rim, 200m below the actual summit. Getting to Makian Island requires you to be at the Bastiong port in Ternate at 5 a.m. After an hour or so of loading up passengers and a two hour journey, with stops at Moti, the speedboat will reach Makian Island. (Both going and returning our boat had too many passengers, too few lifevests and a disturbing roll in even the gentlest of swells, so check the weather forecast before you set out!) I got off at the first port in Makian, which locals call “kecamatan”. Finding a house to stay in and a guide was easy, but your guide will insist on bringing a friend to help clear the trail. Our 9 a.m. start time was undesirably late, but we were able to save time by taking ojeks through the lovely spice gardens for 3 km inland, giving us a starting altitude of 200m. Even so, this hike is extremely hot, so double your normal water supply. The trail is a steep but mostly well-defined plantation and forest trail up to an abandoned nutmeg orchard at 860m. After this, the machete work is almost constant, especially after you enter a sosa reed area higher up the ridge. Dwarf-like stature and a tiny backpack would be advantageous here. Definitely don’t take up a tent, as there are no pitches anyway. At 1150m, you emerge on the crater rim on a boulder that offers views all the way around the crater, provided that the mist lifts. The crater is impressively deep (at least 400m), sharply indented around the rim, open on the north side and mostly cloaked in green, except for a small zone of gently puffing fumerolles on the southwest flank. It’s hard to identify visually which of the several peaks around the crater rim is the true summit, but on the google map it’s shown as being in the southwest corner. You could try asking in villages on the west side of the island if there is a way up to the true summit; villagers in the north deny that there is any such trail. For the route we did up to the crater allow at least 3 hours up and a similar time down. The boat back to Ternate leaves at about 7 a.m., but be sure to board as early as possible before the overloading starts.